Bernd Marin has been named director of Webster University’s Vienna campus, effective Oct. 15. 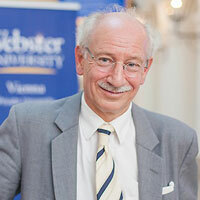 Marin joins Webster from the United Nations-affiliated European Centre for Social Welfare Policy and Research, where he held the post of executive director from 1988 until 2015. Marin looks forward to strengthening Webster's position in Austria while developing endowed professorships and expanding scholarships. A new task force is forming to align the operations of Webster's European campuses in Athens, Geneva, Leiden and Vienna under the guidance of the University's new strategic plan.